Pictured: Vallejo's first public school was built prior to 1870 with citizen's tax money. It was located on Carolina Street near Sonoma Boulevard. 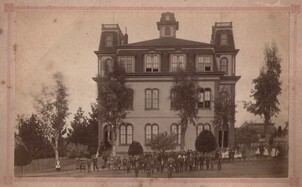 The building was destroyed by an arson fire in 1894. This photo was taken in 1887. 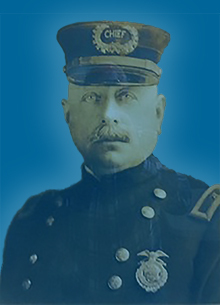 William Stanford was named Vallejo's first Chief of Police on April 4th, 1900. He was a Mare Island Naval Shipyard mechanic with no prior law enforcement experience. He continued to serve as Chief of Police until his retirement in 1936. Photo courtesy of the Vallejo Naval & Historical Museum.